Webinar Description: October 13 marks World Thrombosis Day—a day to focus attention on the often overlooked and misunderstood disease of thrombosis. The International Society on Thrombosis and Haemostasis (ISTH) is proud to collaborate with the Centers for Disease Control and Prevention (CDC) in supporting World Thrombosis Day and the efforts to place a global spotlight on thrombosis as an urgent and growing public health problem. In honor of World Thrombosis Day, ISTH and CDC are co-hosting a special webinar on venous thromboembolism (VTE) and pregnancy. Pregnant women are especially at increased risk for thrombosis, particularly venous thromboembolism (VTE). Women who have a history of thrombosis or inherited or acquired risk factors for VTE (also known as thrombophilias) may be much more likely to develop VTE when pregnant. Additionally, pregnant women who are hospitalized or have surgery are at increased risk for developing healthcare-associated VTE (HA-VTE). In this webinar, Dr. James will discuss the key issues concerning the occurrence of VTE during pregnancy and the postpartum period. Describe the epidemiology of pregnancy-related thrombosis. Describe the underlying biologic changes and causes of pregnancy-related VTE. List the risk factors for VTE at the time of childbirth and in the postpartum period. List the strategies for managing and preventing VTE at the time of childbirth and during the months after delivery. Describe an appropriate risk assessment of VTE for pregnant women. Describe how to talk with patients about their risks for HA-VTE. Dr. James is Consulting Professor of Obstetrics and Gynecology at Duke University, where she also has an appointment in the Division of Hematology. 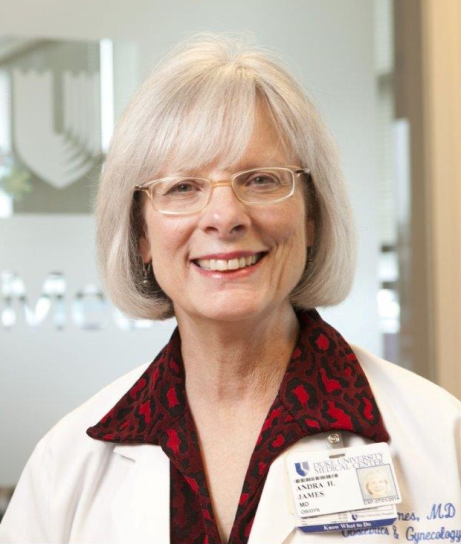 Dr. James is currently president of the Foundation for Women and Girls with Blood Disorders. She also serves on the Medical Advisory Committee of the Platelet Disorders Support Association and the Medical and Scientific Advisory Board of the National Blood Clot Alliance. She previously has served on the Board of Directors of the Hemostasis and Thrombosis Research Society, as chair of the Women’s Issues Scientific Subcommittee of the International Society on Thrombosis and Haemostasis, and on the Medical and Scientific Advisory Committee of the National Hemophilia Foundation. During 2011-2012 she was a special advisor to the Director of the Division of Blood Diseases and Resources at the National Heart, Lung, and Blood Institute at the National Institutes of Health. She has frequently partnered with the Centers for Disease Control and Prevention on other projects to benefit women with blood disorders. This webinar is free and open to public health professionals, clinicians, and researchers who desire more information about VTE and pregnancy. Please register here: http://digitell.io/isth_cdc.